Sega has been a big name in the videogame business for quite some time now, with successful home systems as well as some of the top arcade coin-ops to its credit. Space Harrier is a translation of one of its coin-op machines, and although I can't comment on the arcade version of the game, having never played it, I can say that the ST version is addicting indeed. To quote from the game's instruction sheet, "You are Space Harrier—one of the most experienced astral exterminators in the galaxy. But even for someone with your skill and cunning, this is one treacherous assignment, because this once-peaceful land was invaded by an army of the most ghastly creatures ever to pollute the galaxy." Yep. This is a straight shoot-'em-up, and the action is sizzling. 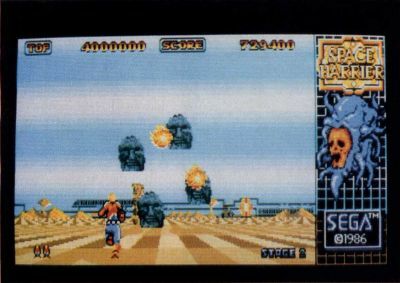 As you control the figure of Space Harrier on the screen via the joystick or mouse, you're going to have to have sharp reflexes to guide him through each level as he plunges "into" the screen at dizzying speeds. (It seems like you're traveling at least 100 mph.) The scenes come streaming toward you in a convincing simulated 3-D. There are many obstacles on the ground and in the air that you must manuever around or blast out of your way. The on-screen figure can be manuevered in any direction, and he can fire on the enemy using his laser blaster, which seems to have an unlimited supply of energy. While the sound effects are only average (the digitized voice that tells you to "get ready" for the next round is barely understandable; it took me a while to even figure out what it was saying), the graphics are truly spectacular. Once you get into the game, you be fighting as much to see what's on the next level as you will be to attain a high score. And speaking of high scores, Space Harrier really racks them up for you. Scores in the millions are typical. In fact, within the first hour or so of play, you'll probably break the two-million mark. (I know. I know. Scores are only relative. Just because they crank them up faster doesn't mean you're actually getting anywhere—but, man, it sure feels like it.) The top seven scores are saved to the game disk, so you find yourself saying, "Oh, just one more game" as you attempt to break your own record. Although the graphics are splendid, the animation is less than satisfactory. On the lower levels, when there is not so much happening on the screen, things move along smoothly. But when you get to Level 3 or 4, on-screen action gets very jerky. Rather than slowing down the action to compensate for the extra number of images that must be handled (not a satisfactory solution either), the images are just not updated as often. What this means is that, as they move quickly, the animated objects seem to vanish from one place and reappear in another, with no movement between. This gives the game a sluggish feel on the higher levels. Still, I keep loading the thing up and trying to blast my way onto a higher position on the high scoreboard. If you like fast-action shoot-'em-ups, you'll probably adore Space Harrier. On the other hand, the game does have an unusually high price tag; so you might want to be sure the game is right for you before plunking down the cash. Recommendation: Get a demo before buying.